The 80's Toy Ark: Third Treat Heart Pig Poseable Found! Woke up this morning to some super exciting news! Hayley from the UK emailed me about a certain plastic piggy she found in her storage. Recognize him? "I bought a load of poseables from the car boot stall and didn't pick up treat heart then I decided to go back to the stall at the end and thought I'd buy a another bundle of them and saw the pig and thought how strange as I didn't know they did a pig care bear so I bought the second bundle of 10 figures . . ."
Heyley writes that this and the other poseables sat in storage for a few years until she decided to look him up. She had no idea what she found! 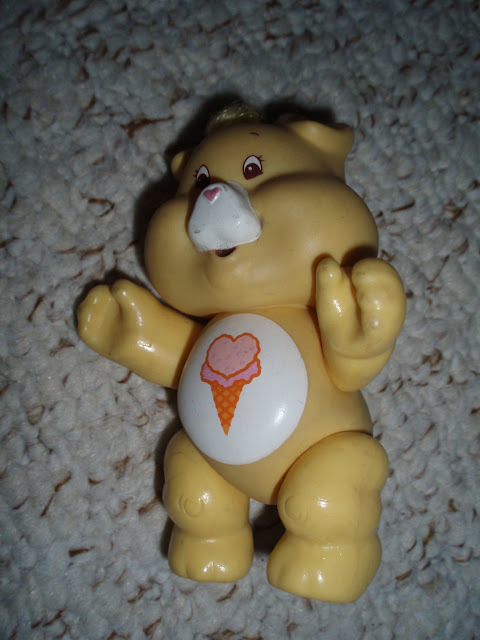 There are only two other known Treat Heart Poseables. I own one and the other is in the possession of a nice collector named Jen. Her site, Poseable Paradise can be found here. Many of you remember that last month the plush version sold for almost $8K! So that begs the question, will Heyley sell? "As I am trying to de-clutter my house, unfortunatly my care bear collection is having to go so I think I will be selling treatheart at some point." It may be a little while before Hayley sells but she will definitely let 80's Toy Ark know so I can link to the eBay auction. This will give you Pig-lovers time to save up or take out a small loan! I love stories where people find ultra rare things at garage sales, thrift stores and in their attics. The fact that all but two of the rare cousin poseables were found in this way suggests that these may have been released in very tiny quantities overseas. They have been found now in the UK (Treat Heart, Proud Heart), Australia (Playful, Loyal and Proud Hearts), Hong Kong (Playful Heart) and finally in Cincinnati Ohio, where Kenner headquarters is located (Both Treat Hearts and a Proud heart came from an ex employee). At first I assumed these were prototypes, which is still possible since none have factory markings. They could be vendor samples, passed out to purchasing departments within major chain stores. We may never know! It's interesting to mention that Hayley has also found a Playful Heart Monkey plush in her second-hand adventures. Lucky girl! Hi does anyone know if this posable sold? Treat Heart Pig poseable just sold on ebay from an Ohio seller. So their are 4 in existence now? Does anyone know if there is a treat heart pig care bear cousin for sale ANYWHERE?